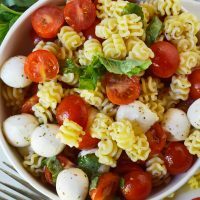 Caprese Pasta Salad Recipe is a simple yet flavorful side dish. 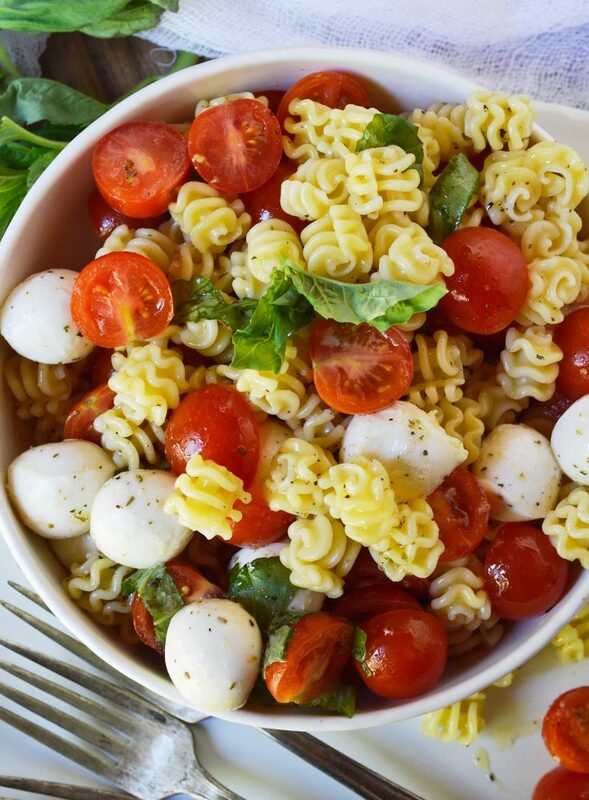 This pasta salad is filled with mozzarella, tomatoes and basil. Tossed with an Italian oil dressing and topped with balsamic glaze. Don’t start making everything pumpkin spiced just yet. We still have another few weeks of summer. 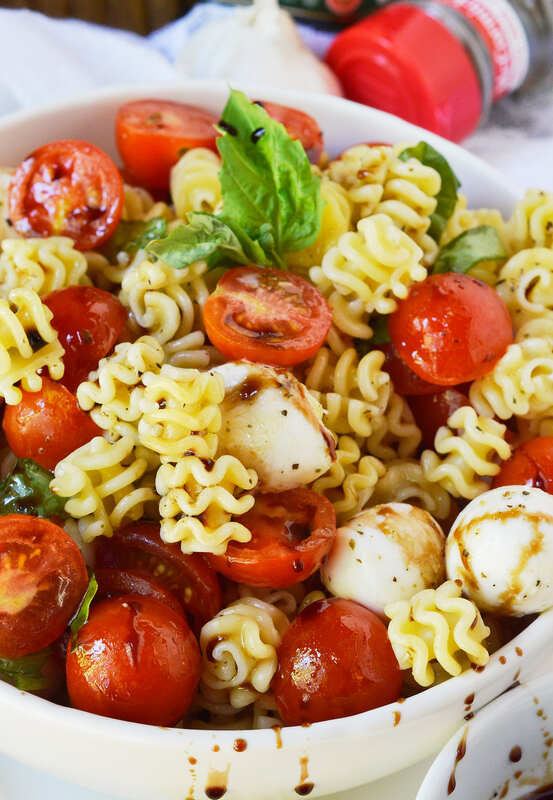 A few more weeks of warm sunshine on our face, iced coffees and garden fresh recipes like this Caprese Pasta Salad! The amazingly fresh fruit and vegetables are one of my favorite things about summertime. Now if I could only grow my own garden. Unfortunately, gardening has never been one of my skills. I swear, you either have it or you don’t! And up until now I definitely DON’T have it. But this summer I have been working hard not to kill all the poor plants that are unfortunate enough to be under my care. I am thrilled to report that I have kept succulents, a ponytail palm and a basil plant alive all summer! If I can do it anyone can! Seriously, anyone. Who knows, maybe next year I’ll even grown my own tomatoes for this recipe. The best thing about using garden fresh ingredients is that they taste so darn good that there is no need to overcomplicate things. This pasta salad has just 4 ingredients not counting the dressing. I like to make pasta salads with interesting flavor twists. 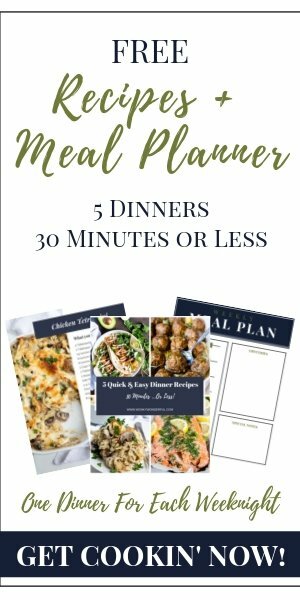 My Bloody Mary Pasta Salad, Spinach Dip Pasta Salad and Jalapeño Popper Macaroni Salad are all perfect for potlucks! I used these swirly radiatore pasta noodles because I was in a swirly kind of mood that day. Feel free to use your favorite pasta. Shells, bowtie or rotini pasta all work great too. 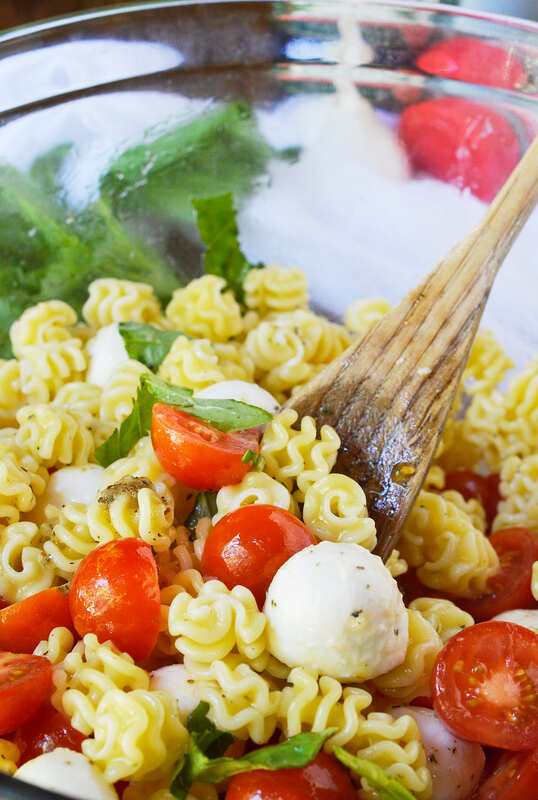 This Caprese Pasta Salad Recipe makes a fantastic picnic or potluck side dish. Or serve with grilled chicken for light summer meal. Join My Wonky Wonderful World and Never Miss a Recipe! Cook pasta according to package instructions. Drain and let pasta cool completely. While pasta is cooling, mix all dressing ingredients and let sit. In large bowl, combine tomatoes, mozzarella, basil, salt/pepper and cooled pasta. If not serving immediately wait to cut and add the basil until just before serving to prevent darkening. Toss pasta salad with dressing until evenly coated. Serve with a drizzle of balsamic reduction. This post contains affiliate amazon links. Basically, I get a little kick back for sending you over to amazon . . . at no extra cost to you. Thanks for your support! I could basically live off pasta for the rest of my life! Your pasta recipe sounds delish! This sounds so good I’m going to make it tomorrow. Does it keep well in the fridge for at least 3 Days? It does keep well in the fridge. 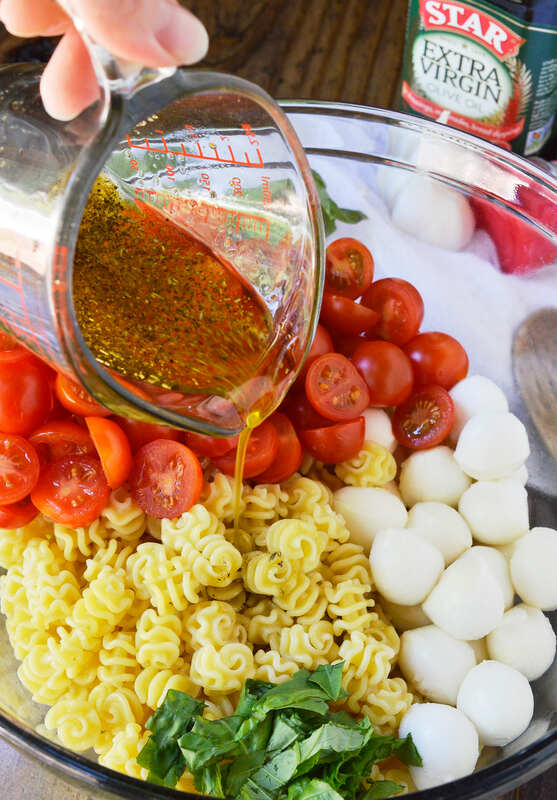 You may need to add a little drizzle of olive oil after a day or two if the pasta salad soaks up the dressing.